Along with the gums, your teeth’s roots help stabilize them. Without them your teeth couldn’t handle the normal biting forces you encounter every day. 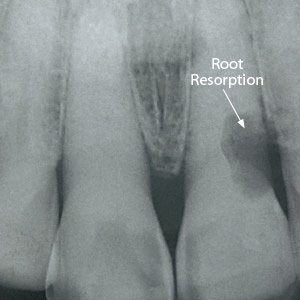 That’s why a rare condition called root resorption must be treated promptly: this gradual breakdown and dissolving of root structure could eventually cause you to lose your tooth. Resorption is normal in primary (“baby”) teeth giving way for permanent teeth or sometimes during orthodontic treatment. But the form of resorption we’re referring to in permanent teeth isn’t normal, and is highly destructive. The condition begins in most cases outside the tooth and works its way in, usually at the gum line around the cervical or “neck-like” region of the tooth (hence the term external cervical resorption or ECR). ECR produces pink spots on the teeth in its early stages: these are spots of weakened enamel filled with pink-colored cells that cause the actual damage. The cells create cavity-like areas that can continue to enlarge. We don’t fully understand what causes ECR, but there seems to be links with excessive force during orthodontics, tooth trauma (especially to the gum ligaments), tooth grinding habits or internal bleaching procedures. However, most people with these problems don’t develop ECR, so the exact mechanism remains a bit of a mystery. The good news, though, is that we can treat ECR effectively, provided we discover it before it inflicts too much damage. That’s why regular dental visits are important, coupled with your own observation of anything out of the ordinary and immediate dental follow-up. If the affected area is relatively small, we may be able to remove the cells causing the damage and repair the area with a tooth-colored filling. If it appears the pulp (the tooth’s innermost layer) is involved, we may need to perform a root canal treatment to remove infected tissue and fill the empty space with a special filling. You may also need other procedures to reduce the chances of gum recession around the affected tooth. Proactive dental care is your best insurance against losing a tooth to root resorption. So keep an eye on your teeth and see your dentist regularly to keep your teeth and gums healthy.